Ever since I watched Mr Wormwood in the film Matilda use a drill to wind back a used car speedometer so it looked like it had done less mileage, I’ve been a little wary of car salesmen. They’re often a poorly represented bunch: images of men wearing painfully cheap suits, with their greasy hair slicked back and rubbing two hands together sneakily seem to spring to mind. Obviously this is a massive (mostly false) generalisation, and doesn’t even take into consideration the large percentage of female car sales people. But that being said, there’s a reason why their reputation is centred on lies, phoniness, and general sneakiness. Getting a new car is exciting, but it also comes along with a long, painful process. Salesmen know that you’re keen to get a nice new set of wheels, and they’ll do anything possible to try and rush you into driving away in something from their caryard that same day. “Unfortunately you can only get this price today”, “this is one of the last models left anywhere across the state”, “someone else is actually interested in this same vehicle”; any of these sound familiar? They are all common tactics to try and get you to sign the dotted line as soon as possible. To avoid this, it’s as simple as taking your time. I get that you’re probably champing at the bit to upgrade from your current car into something shiny, but the more time you can take, the better deal you’re going to end up getting. In most cases, you should completely avoid buying anything the same day that you enter a dealership. Wait a day, or even come back the next weekend, and then you’ll have further time to do research, think about the decision, and let the salesman sweat a bit. 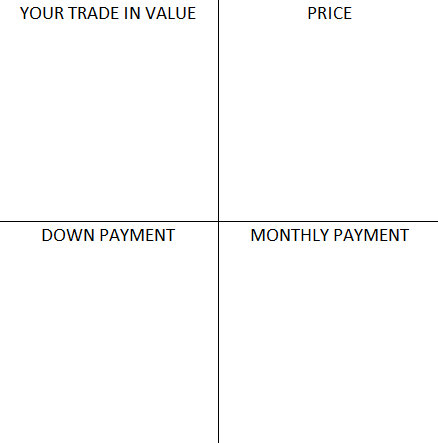 After “consulting with his manager”, the salesman will then fill out each of these squares with numbers that are both insulting your intelligence and your budget. If you have a trade in vehicle, the initial offer will be insultingly low, and the price, down payment, and monthly payment will be way more than you expected. By presenting four numbers at once, the salesman is able to both confuse you, and give himself plenty of wriggle room for still ripping you off. For the majority of people who are insulted by this initial offer, he’ll offer sympathy and talk to you about what you were expecting. Here he can gauge what’s really important to you: for many it will be the monthly payments, closely followed by what they were expecting for their trade in value. Through a back and forth negotiation that sees him theatrically go and talk to his manager between discussions with you, he’ll get closer and closer to the numbers you want while subtly moving around other numbers to compensate. In the end, you’ll be exhausted and, seeing that magic trade in value or monthly payment number is what you want, not even notice that everything else on the sheet is still ridiculous. One of the best ways to get around the 4 Square Method is to simply understand it. You can even tell your salesman that you know exactly what he’s doing. Further to that, keep your focus on the price of the car, not the monthly repayments. It’s an easy trap to fall into thinking the monthly repayments are quite reasonable, and not realise that the dealership is extending your loan period to make you end up paying way more. This is a particularly sneaky move that doesn’t seem like it should ever happen, but unfortunately, sometimes it does. The call back is used particularly against a buyer who has a bad credit, and involves the salesman promising you a great interest rate, having you sign paper work, and letting you drive away… only to call a week later to tell you that terms have changed. After you’ve been given a week to drive your awesome car, as well as show it off to your friends and family, the last thing you want to do is return it. For that reason, a large majority of people simply (although begrudgingly) agree to pay the higher interest rate. The way to avoid this is to find out what kind of interest rate you would be approved for before you go car shopping. Get a couple of quotes from various loan companies and see what works for you. That way, when the car company offers you an interest rate that seems way too good to be true, you’ll know if it really is or not. If you want to avoid the trade-in value scheme, or you just want quick cash to help you with your down payment, why not sell your car to Are You Selling? Talk to us today!